As Players raise their friendship with Yoshitsune they will be able to Smith higher grade weapons. Additionally raising friendship with her and providing her with recipes will increase the different types of weapons that can be Smithed. 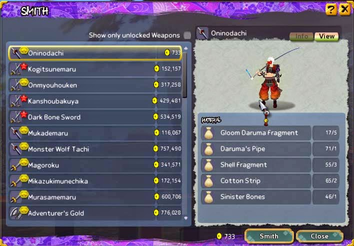 In order to begin Smithing players need to provide Yoshitsune with materials that include weapons, monster drops, stones and various other materials.